Manjusri for learning and wisdom. Chenrczig for compassion and healing. Tara for the female aspects of compassion and Kalachara. the wheel of time. 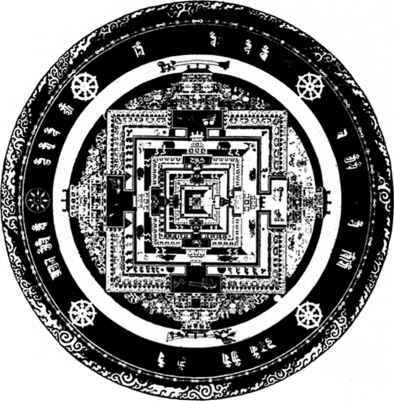 The mandala in the picture showing Kalachara represents how things come into being and then pass away. In Tibetan traditions of Buddhism, mandalas are created for initiation rituals, when the teacher gives the pupil permission to meditate on and follow the teachings of a certain deily in order to produce the same attributes. This is known as direct transmission of the teachings, or empowerment. Both the mandala and the deity who lives in it are recognised as representatives of aspects of the fully enlightened mind, and that this reaches out and blesses all and everything that comes into its environments. 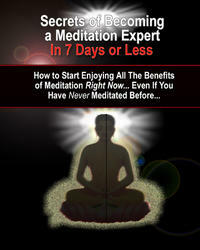 The concept is that the seed of enlightenment and awareness are nourished by meditating on a mandala. and that the illusions of the world are seen for what they are. giving freedom from desire and attachment. They are created in the spirit of the awareness of non-permanance. and non-attachment to the results of one's efforts. 29 Drop up i. Turn both palms over ii. Shift your weight forwards onto the left leg iii. Raise the right hand and lower the left hand. This movement has the same affect as movement 28. except that it transfers Qi from the left lung to the right lung and opens the Qihui points. i. Close the finger tips of the right hand (i.e. all finger tips touch each other. Drop the right hand straight down so that the fingers lightly 'hit' the Quepen point. ii. Stand on your toes and shift your weight to the back (right) leg. Drop down and back onto the right foot. iii. 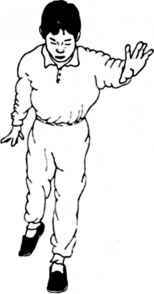 Quickly raise up the left hand so the palm faces the forehead from a distance of about a foot. This movement requires some co-ordination. All three parts should start and finish at the same time. Qi will transmit from the left Laogong point to the Sky- Eye. At the same time the right fingers stimulate the right Quepen point which connects to the stomach. 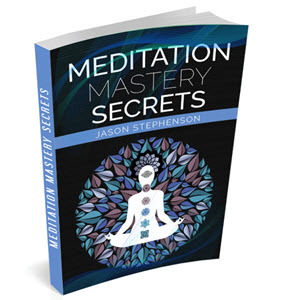 The jerking movement, as the weight drops onto the right foot, releases negative Qi through the legs. 31. Scoop the Moon i. From the Quepen point, the right hand extends back and up. Open the palm and fingers to collect Qi from the sky. ii. Scoop the hand down and forwards so that it passes in front of the left leg. Meanwhile bend forwards, but keep your weight on the right leg and the left leg straight. iii Finally our hand should cup your head with the right hand facing the Sky-eye and the left hand facing the right Tong zi liao point. With the Laogong point facing the Sky-eye and Tong zi liao point, the Qi will cross over the head and help to open the sky eye and. balance the head. 32 Turn the Body i. Keeping your hands and upper body in the same relative position, turn on the heels (beginning with the left heel and then the right heel) so that you turn through 180 degrees. As you turn, transfer your weight form the right leg to the left leg. You upper body should remain unchanged, but your legs swap roles ii. Having turned, move the left hand back to the left hip. touching the Hegue and Huan Tiao Points. iii. 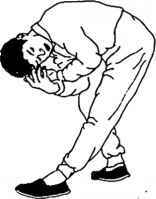 Then raise your body up and forwards, shifting your weight onto the right leg which should be bend at the knee. 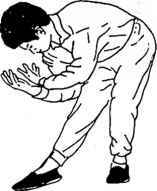 By bending down and keeping your weight on the right leg and turning, you stimulate the Hui Yin point to help open it. Touching the Hegue to the Huan Tiao point releases Qi to this area, which connects to the gall bladder. Qi will move from the Dantien to the head.